Sebastian, you’ve been engaged in humanitarian work since a long time. What drives you? The vulnerability of the human condition? In 1999, Hurricane Mitch took away thousands of lives and made hundreds of thousands of people homeless in Nicaragua. At that time I'd committed myself to a project where I was supposed to work with street kids - and when I arrived there I couldn’t help but support local medical teams in disaster response with my paramedic background. So, my first engagement in humanitarian aid was sort-of by accident, but I understood right away that this is what I wanted to pursue. I then joined a range of disaster response teams, for instance to help after the Haiti earthquake (with a death toll way over 200,000 people), through to the Typhoon Yolanda in the Philippines in 2013. It was a very intense and productive time, with some awkward experiences on the other hand. When I say awkward, I mean, for example, the repetitive patterns of Western aid: somewhere a catastrophe happens, then a lot of white people from Europe and North America come and do things they think are the right ones in a manner they think is correct. It's a combination of extremely disorganised and extremely bureaucratic processes, with huge amounts of money being spent and after some time the aid workers disappear with nothing left behind. While that happens in a few weeks, the actual work transpires over months and maybe even years. I thought that there should be alternative ways to help. For instance, by working much closer with local communities and also by finding ways to improve the whole area of logistics. I was looking for an effective model between the large aid organisations, which often waste tremendous amounts of money, and very small grass root organisations, which come there with two suitcases filled with medicine and no real plan. Also, I was involved in the music festival business for about ten years. It sounds like a totally different thing but when you look at it from a logistical view it’s about going somewhere with no infrastructure and building something up that's highly functional with water and power supply, medical support, and so on, within a very short time. "I learned a lot from that experience, and became friends with people who lived up to that community spirit." Against this backdrop and out of this context we founded CADUS. Maybe this is an important aspect which brings in a different spirit to our organisation. What kind of particular impact does it create when you work in disaster response? Well, we always work with exploration techniques, meaning we go there prior to our mission and discuss with local people what they are able to do on their own, what are their very specific needs, and we can bring in. You know, currently, a big thing in aid business is "capacity building". The ideas to create sustainable structures and develop local resources are good, but you cannot blanket apply them - regardless of the situation on the spot. For instance, in Northern Syria there are already a lot of self-administrated structures built up by refugees, but they face a lot of political problems. So the best support in that context would be to help solving these political conflicts. Are you able to build up sustainable local structures? Partially, yes. We always start working with the question: what do we have to do here so that people won’t need us anymore? Of course an important aspect of this question has to do with education and training programs such as 'Train the Trainers'. But you can only do that when you come back periodically, which in some areas like in North Syria doesn’t work. Hence, we thought, OK, we need to go beyond that and think about a concept which works remotely, as well. And, so we developed an e-learning concept. Another approach is to use equipment that has been in use there before, so people already have the experience in maintenance and repair, and perhaps spare parts are available locally. We applied this when we built our mobile hospital. As a carrier, we used a vehicle that has been exported to the Middle East for decades. But then there are projects which can’t be sustainable by nature, for instance our sea-rescue mission. You go there and save lives, that’s what’s needed in that very moment, and we’re only there to provide help. Sure, and with all due respect to sustainable measures, people need instant help — like in Mosul in Northern Iraq. Why is it that CADUS, being a comparatively small organisation is one of the only ones that provides medical support apart from Medicines sans Frontiers (MSF)? I enormously respect the work of MSF - their whole organisation is highly sophisticated, drawing from a very large pool of knowledge and experience. But they are a very large organisation which needs to deploy pre-developed procedures, for instance when it comes to security measures to provide sufficient safety for the people who are involved in their respective missions worldwide. Meaning, out of efficiency requirements, they need to develop worldwide adaptability solutions. "CADUS as a small organization, can thus be much more flexible and adapt to local circumstances more easily." So, in this case MSF is situated a bit outside of Mosul, while we found an individually designed, small scale solution providing security within the city where people need medical help, too. How do you maintain CADUS’ engagement and how do you finance all these activities? Well, we receive funding - however we’re always financed insufficiently according to the scope of the particular mission, so we constantly find ways to realise a project, which usually means that our team works voluntarily without being paid sufficiently. What keeps us going is the motivation that comes from accomplishing our mission within the given difficult circumstances. "We constantly find ways to realise a project, which usually means that our team works voluntarily." How many people does your team comprise of? The core team is about 10 to 15 people, all of them work very hard, and then there is a group of supporters of about 30-40 people. And, how are you personally doing this job, are you making a living? No, not at all, but I’ve decided three years ago that I want to do this work. I’ve been in the traditional paramedic work for 15 years, additionally serving as a workers’ council within the paramedic organisation, that was really frustrating. "Practically that means six days week for CADUS, and three nights as a club bouncer in Kreuzberg, Berlin." So, I’ve said I will build up CADUS to a level that it’s sustainable and able to pay for people like me on a regular basis, but until then, like my colleagues, I make my living with precarious side jobs. In my case this is to work as a bouncer. Practically that means six days week for CADUS, and three nights as a club bouncer in Kreuzberg, Berlin. Could you describe your last year? Is there a typical schedule, how often are you away for a mission, how much of your time do you spend here for preparation, administration and funding? Support CADUS Mobile Hospital Mission by donating to their betterplace campaign here. How did you raise that money then? … We gathered 20,000 Euros through our betterplace campaign, and the rest was provided through donations and support from our club and music festival network. For instance, there is a network in Hamburg called "Off the Radar" which supported us a lot, as well as "Audio Lead", a music label also from Hamburg, which helped to raise a lot of donations. Furthermore, an initiative called "MV for Kobane" from Rostock, which decided to allocate their support for our Mobile Hospital Project. With 40,000 Euros in October available, we managed to reach 100,000 Euros by the end of the year. So that was 2016. 2015 was quite different. I was in Syria five times, for training missions. In between we came back to Berlin, raised money, went back again and so on. However, we could be way better in fundraising, but, let me put it this way: people who are doing this kind of humanitarian work are not the best promoters, and I mean this in a way that they are often too modest, they feel that they would praise themselves if they talked too much about what they are doing as volunteers. So, we have to improve our fund raising skills through involving professionals in this important field. But, you know, it’s also a matter of media attention. For instance, we were talking to TV stations, and what they said was that it would be better to do broadcasting from Syria, whereas our mobile hospital mission focusses first on the area around Mosul in Northern Iraq. How do you deal with these mechanisms of media and promotion? Well, it's really awkward for us, because the feasibility our medical missions depend on so many factors; we cannot and, of course don’t want to go to certain areas just because media attention is high, and thus, may be make the funding easier. Let me give you another example, it’s not media related, however it displays how media and promotion affects donor organisations: recently, I applied for funding from a multinational pharmaceutical company, which set up a large fund for disaster recovery. After examining my proposal, they said: we see the necessity, but there is too much "catastrophe" in your application, it’s too negative, why don’t you say more about "hope" and make the story more positive? Really? I mean, of course it would be nicer to talk about hope, but the situation is a catastrophe, and because there is a catastrophe happening every day people need our help! "There is too much catastrophe in your application. Can't you talk a bit more about hope?" When you are on a mission, how much money do you need per day to fulfil your medical aid requirements? From our initial funding of 100,000 Euros we invested almost 70,000 in the mobile hospital vehicles and more than 30,000 on medical material. With this infrastructure and equipment we are able to provide what we call trauma triage to injured people, large wounds can thus be medically treated with a capacity of two operations at a time and ten beds for further therapies. To fulfil this we need medical material which costs around 15,000 Euros per month. That’s comparatively little money, which is also due to the situation that we don’t do general health, which requires the dispensing of antibiotics etc. which would increase our costs significantly. Then in 2016 you started CADUS’ Sea Rescue Missions. Right, the Sea Rescue Missions became our second area of activity — in the Aegean Sea, as well as in the Mediterranean. And how did these missions begin? Well, let me give you some background that brought us there. When we were in Northern Syria the situation can only be described as devastating and full of despair. It’s a region locked up from all sides, extremely suffering under the attacks from the IS, which was — contrary to international law — under a humanitarian embargo from Turkey, troubled with inner Kurdish conflicts. "every day people die, every family has a member or relative who HAS dieD, every day there is another funeral. In some months we had to cope with 3,000 injured people." Within this situation we were providing medical emergency aid and conducting paramedic education programs, and further to this we had plans to build up a proper water supply system and install improved rescue techniques. At the same time we were running around in Germany to collect money, which was very difficult. The situation in Syria was horrible: economically and ecologically destroyed, the war was a gruelling part of people’s everyday life - every day people die, every family has a member or relative who has died, every day there is another funeral. In some months we had to cope with 3,000 injured people. We were fighting the chaos, and equipment got broken and could not be fixed, medication was often not available — it was right what we were doing, but it felt like running against walls. And so, we thought, it would be a good thing to go out on sea where the mission to save lives appeared on first sight a bit, let’s say, clearer to fulfil. Did your expectation match the reality on sea? Well, good question. No, not really. The whole situation about saving lives of refugees is a systemic insanity. First of all, there is always the big question in the room: Why does the European continent, the EU, not offer better solutions to people who risk and often lose their lives? 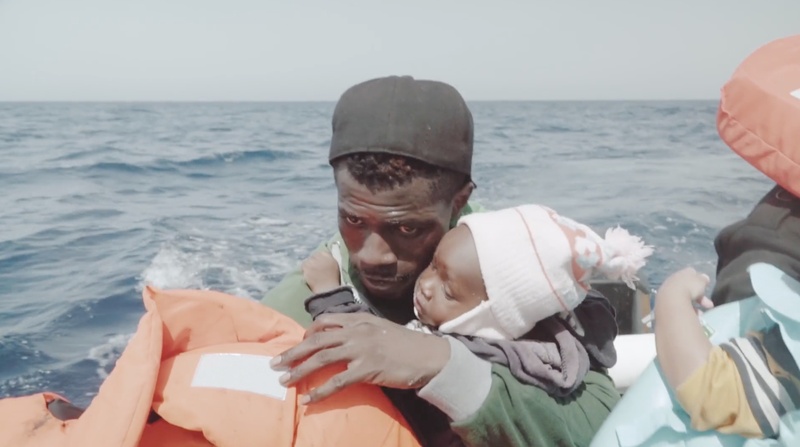 What kind of political and economic system are we living in that looks aside when people go on boats with their little babies knowing the risk of dying while trying to find a better live? And, if you break that down to the situation on sea, how can it be that it’s mostly civil organisations, volunteers like us who do a significant part of the job to rescue people from dying on sea? And, why is it not just a large co-operatively working fleet of vessels that work smoothly together, but so many individual organisations trying do their best? It’s a lot of chaos out there, and we need an open debate what is happening on the Mediterranean Sea. There is Frontex, there are politicians and right-wing trolls who argue that rescuing people from drowning is a pulling in even more refugees. On the other hand, there are humanitarian enthusiasts who set out for help no matter what. "Sea rescue missions are an ugly plaster on the European wound of migration." Well, when Sea Watch started off sea rescue missions, they eventually had the idea to make themselves obsolete by persuading and pressuring politicians to create alternative solutions for refugees and migrants. However, the intention to achieve legal and safe passage for these people failed. So, if you ask me about the current state of sea rescue missions, I’d describe it as an ugly plaster on the European wound of migration. We have created a system where a range of civil organisations regularly have to go beyond their resources and capabilities to save as many lives as possible from dying in the Mediterranean. Support CADUS Sea Rescue Mission by donating to their betterplace campaign here. Tell us bout CADUS’ particular experience with sea rescue missions. We undertook eight sea rescue missions in the Mediterranean Sea and six missions in the Aegean Sea. For us, 2016 was a very intense year, it was very difficult to build up our sea rescue missions. For 2017 we’re thinking about what we can do better, where should we allocate our resources best. Definitely we need to improve and put more focus on surveillance from the air. So, what are your plans the for your sea rescue mission in 2017? We will develop a new approach. Our intention is to achieve a better coordination between the different sea rescue missions. We don’t want a self standing mission but to join forces with other NGOs. We want to involve CADUS in a better surveillance from the air and work together with Sea Watch and HPI Humanitarian Pilots Initiative. Also, we want to focus on human rights violations coast by the coast guards off the Libyan shore in the Mediterranean. We still have an own vessel in the Aegean sea. We’re providing this to another organization. There is a betterplace campaign to raise funds for the mission, mainly for the maintenance of the ship. Do you see enough awareness in our societies? Unfortunately not. It’s still so far away from people’s every day life. For us nothing really changes, when I ask to someone in a club whether they know what’s happening on the Mediterranean Sea, most people have no idea. "What we actually should discuss is: What is Europe’s responsibility in this situation, in this crisis?" The general debate is just scratching the surface. It’s about whether we create incentives for migrants when we rescue them, whereas what we should discuss is: What is Europe’s responsibility in this situation, in this crisis? Because we do have the means, to cope with these questions economically. For hundreds of years we have created our wealth and build up our economies on the back of countries, which are now the source for today’s migration. And we are actually still doing it. I think that is very unjust. We aren’t prepared for the future, are we? Currently, we are hardly coping with the symptoms of migration, we’re not even acknowledging the causes. According to the NASA we have the most severe drought since 900 years, you don’t even have to believe in climate change, this is just a fact. So, it’s a total illusion that migration will decrease. People simply have no choice, they have to leave, if they want to survive. So, we’re having wrong debates here. We should think about how these people can be integrated in our societies. "It's a total illusion that migration will decrease. People simply have no choice, they have to leave, if they want to survive." Is there a political intention behind this? Well, let me put it this way: In 2016, when we had thousands of people in Berlin trying to register as refugees, people were in miserable conditions. However, here in Germany we have a superbly functioning disaster recovery. When hey find a left over bomb from WWII in Berlin, they can evacuate and accommodate thousands of people within hours. So, why couldn’t we do this with refugees? Even though we’ve done a lot here in Germany, it is politically intended to display a crisis. However, as a country, and even more as a union of more than 500 Million inhabitants we could do way better.